There has never been more competition in the advertising media business. It’s harder than ever for sales reps to get appointments. Selling around or through advertising agencies to the client, and at the highest level of the media buying or client organization, is the urgent challenge of media companies today. To help your team sell at a higher level and compete for the bigger pie, Dan Ambrose developed SST: Strategic Sales Training, based on Strategic Selling Tactics. We teach how to sell major account advertising, and more importantly, how to sell more accounts and bigger deals than the competition. In today’s competitive environment media that compete only for the budget allocated to their media form or sector are shrinking, while sales teams that sell to the client win a greater share of a larger pie. 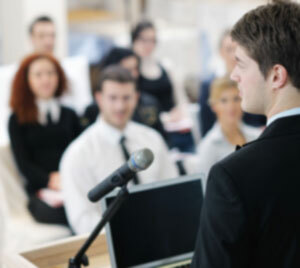 Strategic Sales Tactics Training will enable your sales team to win more sales and greater market share. All the communications skills, presentation skills, and negotiation skills in the world will not help your organization without a sales strategy. SST provides the road map that leads to success with more (and more effective) client calls, bigger sales proposals and more competitive wins. Strategic selling utilizes the classic approach of selling the ‘market,’ then the ‘media’ and finally your ‘property’ in a logic-driven sales approach that made Ziff Davis the recognized icon of well-trained sales staffs. Ambro.com has updated the classic Ziff Davis ‘structured sales’ approach for a more complicated and fluid market. Now SST helps your sales organization sell higher and faster with tactics updated to the early 21st century selling environment of fragmented client-agency-buying service relationships, ‘transactional’ rather than ‘relationship’ buying and selling, hard-to-get appointments and ‘RFP’ driven decision processes. Custom developed with management to address up to 3 critical skills. What it takes for a sales person to get to the right place at the right time with the right information to make a sale. Systems for prioritizing accounts, managing time, gathering information and getting the appointment. Focuses on developing the content of the sales persuasion. Offers a structured problem-solution approach that works from the smallest to the largest advertiser. Demystifies the famous Ziff-Davis structured sales approach and teach sales people the adapted formula for the 21st century. 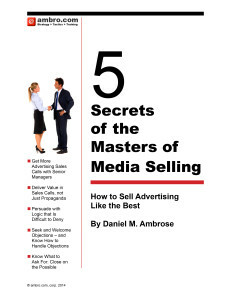 One way to sample the SST Training is to register for Masters of Media Selling public seminars. Learn more here. Contact Us for more information on Strategic Sales Tactics training.